I participated in this sponsored campaign for Palmer’s® Coconut Oil Formula on behalf of One2One Network. All opinions are my own. I may splurge on cosmetics quite frequently, but when it comes to body care, you’ll find 99% of my collection is affordable drugstore items. When I spotted Palmer’s new FIRMING Coconut Oil collection at my local Walmart – including a firming body sheet mask (!!!) – I needed to try it all. Plus, the mild coconut fragrance of Palmer’s products is lovely during the colder (and warm) months. 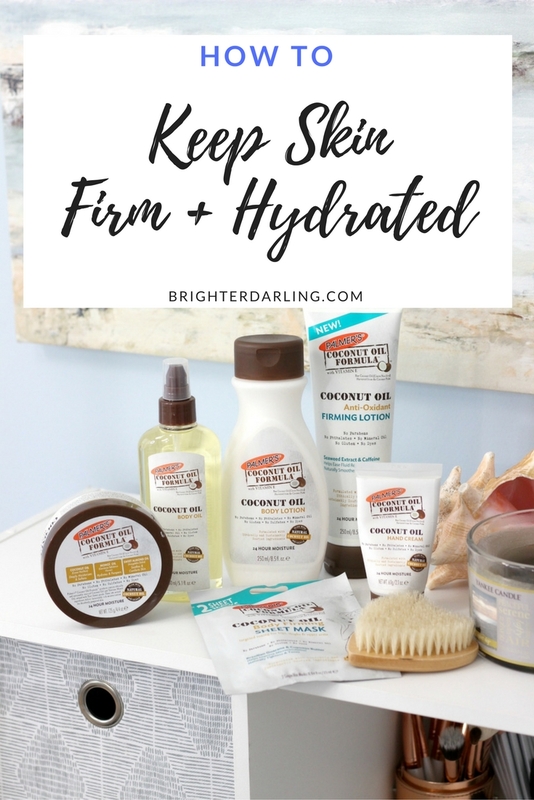 If you’re interested how I keep my skin firm and hydrated with Palmer’s products and want to try them yourself, continue reading. Let’s start with the exciting new products – the firming stuff! …and if you stay through the end, you can win a set of them yourself (see the bottom of post). 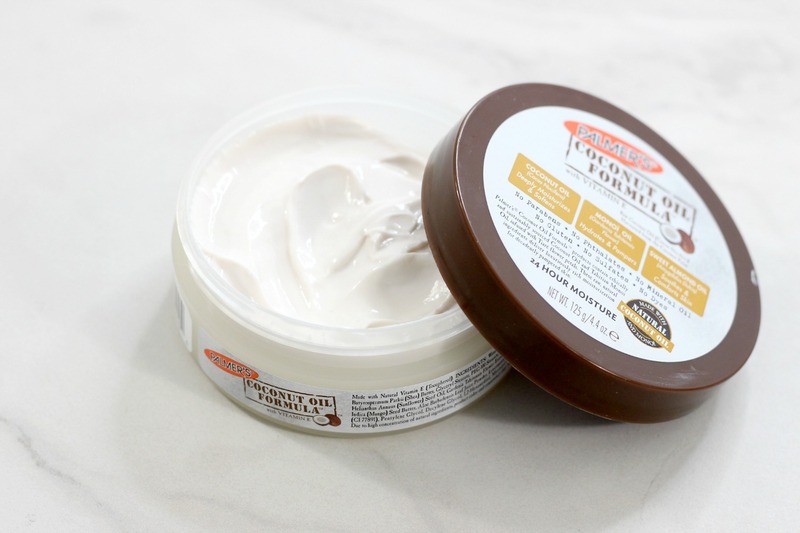 I’ll be honest, when I first saw coconut oil on Palmer’s anti-oxidant firming body lotion, I worried I wouldn’t like the texture for daytime use because I don’t have the time for thicker creams to sink in when I’m getting ready to head out of the house. To my surprise, the anti-oxidant firming lotion is very lightweight and absorbs quickly. It’s infused with caffeine, marine seaweed extract, and sweet almond oil to help diminish fluid retention. The added ‘massage’ of rubbing this product into your skin helps with lymphatic drainage to create a more toned skin texture. Palmer’s anti-oxidant firming lotion has claims of 24-hour moisture. I think it’s a great, everyday body lotion with helpful ingredients for moderate, regular firming. Palmer’s body firming sheet mask was the product that immediately grabbed my attention since I’m obsessed with sheet masks these days (who isn’t?). The body firming sheet mask has Brazilian Guarana to encourage blood flow and improve firmness, giving a more slender appearance. You can use these daily for intensified effects and they’re safe to use on the upper arms, thighs, hips, stomach or buttocks. I love these masks for special occasions like a holiday party or family get together where you may have your arms or legs exposed. The body firming sheet masks are the perfect solution for those of us who love the slimming effects of self-tanner, but don’t like using self-tanner through the winter! 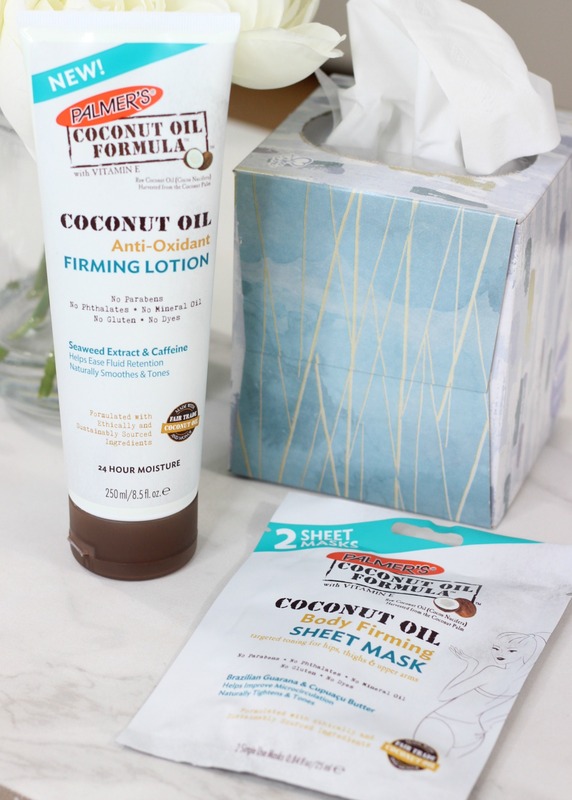 Aside from the fabulous firming products, Palmer’s offers a hydrating solution for any of your skincare woes, complete with the lightweight coconut scent! In the evenings after a nice warm shower, I am IN LOVE (really, though) with the thick coconut oil body cream. I’d almost call this a body butter. The formula is simply heavenly. Super rich, but absorbs so much faster than I thought it would and my skin feels amazing the next day. No dry scales in sight! The Palmer’s hand cream is perfect for your purse as it leaves no greasy residue, yet includes yummy ingredients like coconut oil, coconut water, coconut milk and cocoa butter to protect and repair. If the firming body lotion wasn’t enough moisture and you need the MOST HYDRATING body products, the next two are for you. The Palmer’s Coconut Oil Body Lotion is shockingly hydrating. I expected the texture to deliver a lightweight layer of moisture but this left my skin with that extra-hydrated feeling that lasts through the next day. Naturally, the Palmer’s Coconut Oil Body Oil is going to not just give you extreme hydration, but a beautiful glow. This is great for those with extra dry skin or lovely to apply to the legs, shoulders or chest for added sheen on a special occasion. 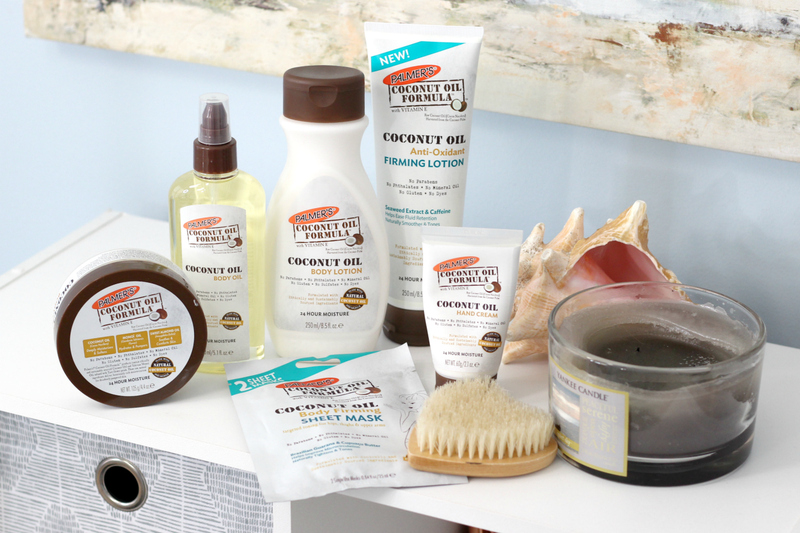 Overall, I’ve been very impressed with my new Palmer’s coconut oil collection of products. It’s also incredible to know that all of these products are free of parabens, mineral oil, sulfates, phthalates, dyes, gluten, and GMOs. Thumbs up for that. If you’re looking to hydrate and firm your skin the healthy way, definitely check out Palmer’s products at your local Walmart or Walmart.com. Don’t forget to pick up a few of those body sheet masks for your upcoming festivities! 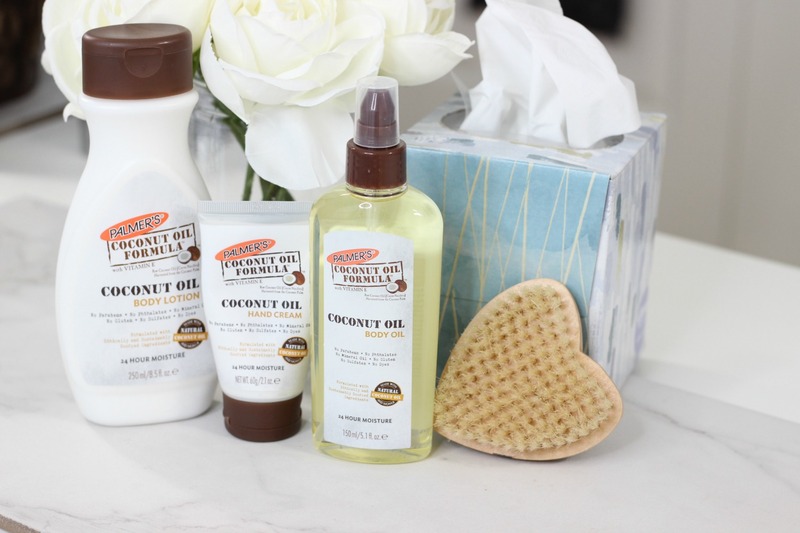 THREE (3) READERS CAN WIN THE NEW PALMER’S COCONUT OIL FIRMING PRODUCTS! ALL YOU NEED TO DO TO ENTER IS COMMENT BELOW [WITH A VALID DISQUS ACCOUNT/EMAIL SO I CAN CONTACT THE WINNER] WITH YOUR FAVORITE WAYS TO KEEP YOUR SKIN (AND BODY) TONED AT HOME. THE GIVEAWAY WILL BE OPEN TO US ONLY AND ENTRIES WILL BE ACCEPTED THROUGH 12/8/17, midnight EST. ONE ENTRY PER PERSON. WINNER HAS 48 HOURS TO ACCEPT PRIZE OR I DRAW AGAIN AT RANDOM USING RANDOM.ORG. "10 Must Have Sweaters For Leggings"